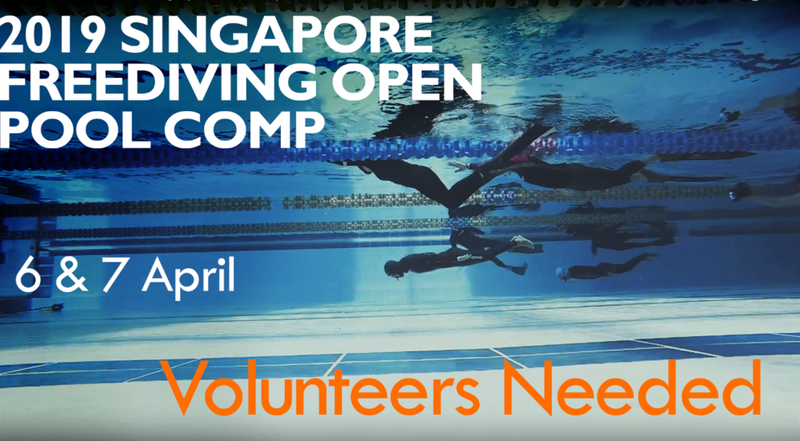 The Apnea Association Singapore is proud to announce the 3rd Singapore Freedive Open Pool competition to be held April 2019. The event will take place over 2 consecutive days starting on Saturday 6 April until and including Sunday 7 April. The competition will be held at the Singapore Sports School in Woodlands (1 Champions Way, Singapore 737913). Fourty two (42) Freedivers of all levels are welcome to compete. Minimum age is 18 years or 16 years with parental consent. Participants need to be in good health. All Participants need to be members of the Apnea Association of Singapore. Your dives will appear in the ranking as a result of the AAS’ membership with AIDA. 12 out of 42 athletes will be recreational grade. Eligible participants can join on a first-come-first-served basis by registering on the AAS website. Registration for the competition will commence on the 30th Jan for Singaporean athletes. Registration for the competition will commence on the 6th February for international athletes. More information about the competition and updates will be sent out in the following days. The competition requires all athletes to be members of The AAS, regardless of Competitor or Recreational grade. Participants that are unable to join subsequent to their registration can transfer their place to another diver eligible to compete in the event before the closing date. There will be no reimbursement of fees if neither the participating diver, nor his/her substitute can attend subsequent to registration. Changes in participants will be recorded during the competition meeting (see below). Closing date one month before the competition date. No substitution to be made after the closing date. There is an event meeting where all competing athletes must be present. It will take place on Saturday prior to the start of the competition. You will be timely informed of the final date & time of the competition briefing. · We will take your freedive announcement for the respective dive days. After completing the registration of all athletes we will give a review of the competition rules and also publish the start list for the competition days. · Instructors & trained safety divers will provide safety during the event. · Every dive will be monitored from the surface. · Safety equipment will be on standby for every dive. The participating safety team, Judges and Organizers have the right to refuse the start of any athlete if diving would pose an obvious risk to the diver's health. The prize-giving awards ceremony will be held on Sunday evening at a separate location after the competition. More details will be given out at a later date. We hope this information is helpful, please contact us at aas.events.team@gmail.com if you have any further questions! We wish everyone successful training and hope to see you in April! Please read all the information above, before clicking on register.